Welcome to the world of modeling, was the response I got. But this was not your typical modeling shoot. There were no makeup artists, no hair stylists, no lights or fans, no Photoshop or re-touching. As we arrived by the spiraling staircases, Katie took off her heavy winter coat and began to warm up with some Sun Salutations on the frozen ground. Moving her body with her breath, she gracefully stretched her arms towards the sky – inhale, swan dive forward – exhale, lifting her eye gaze to the horizon – inhale, and so on and so on. We all three studied the three black, metal (and cold!) 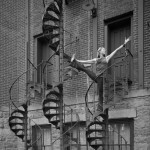 spiraling staircases and discussed which yoga asana (pose) would fit best with the swirling lines of the structure. The twirling fabric at the bottom of Katie’s yoga pants takes you further into the thoughtful investigation of how this moment will be captured. Carl has Katie try a few different poses on the staircases like Garudasanawhich means “Eagle Pose” where her arms and legs are wrapped around one another but he was not happy with the way her body seemed to get lost within the architecture. After the shoot (and when Katie unthawed) we headed back to Pearl Street to one of our favorite restaurants, The Kitchen Next Door, ordered some kale chips and got started with the interview. 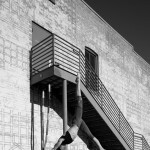 Katie Armstrong, model, yogini and owner at The Om Collection, which features all of the clothing in this article; and Carl Kerridge, photographer, seeker and peaceful warrior collaborated to bring together the fashion and beauty of yoga combined with the fixed form of architecture both locally and nationally. Jessica Durivage: Where did the inspiration for this series come from? Carl Kerridge: I think at least one part of this series dates back to my childhood; my father is an architect so I remember growing up looking at blue prints in his office with fascination. My whole life I have loved buildings and found great joy wandering the streets of foreign lands with no destination, just observing the structures. The idea of blending yoga asanas with architecture has been developing in my sketch book since I moved to Denver one year ago. The yoga community and businesses here have been so supportive of the idea and it has been wonderful to have worked with so many teachers, students and friends. 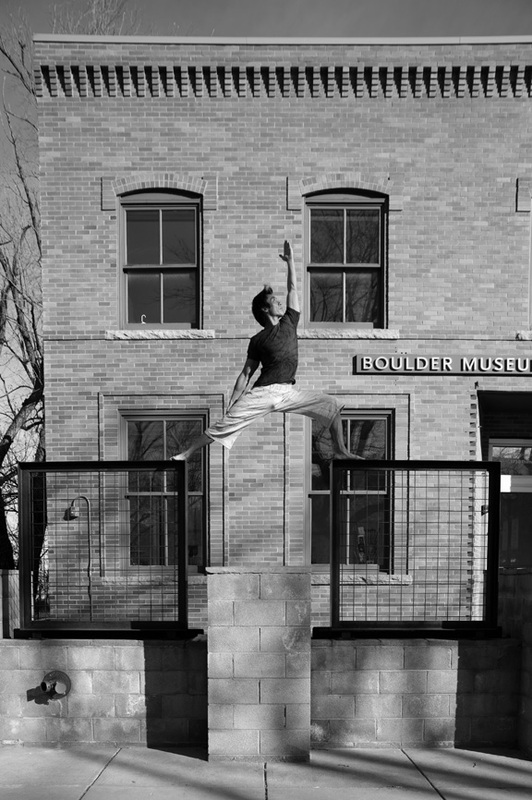 I would like to especially thank the Dushanbe Teahouse and BMoCA in Boulder for allowing me access to shoot at their facilities. Jessica: What is your inspiration for the passion that drives creating clothing that is fashionable in and out of yoga class? Katie Armstrong: The idea is that we live in a really fast paced world, that shouldn’t mean we have to sacrifice comfort, esthetics or mindfulness, so my goal is to integrate beauty, function and environmentalism into clothing. Jessica: Can you name a couple of examples of how the clothes integrate beauty, function and environmentalism? Katie: We try to use fabrics and designs both for men and women that allow for full range of movement, whether that is dance, hiking, yoga, walking or travel. The way we integrate esthetics is we focus on bright, brilliant, exciting colors; spirals or flowing fabrics, cuts that work with a man or women’s body to accentuate the best features or maybe hide or play down the more difficult parts. As far as environmentalism goes we see consumption as the biggest problem when it comes to fashion. Sure, there are issues with fabrics and chemicals but if you buy a garment and wear it down to its death you are actually cutting down on environmental impact as opposed to buying something new each season and getting rid of it. My goal is to offer clothes that you love and adore, that you’ll be able to wear all day for every activity and you are able to wear into the ground. Then, you are cutting back significantly on the amount of consumption. This year we are also launching both a bamboo line and an organic cotton line for our women’s clothing. Last year our men’s line had a lot of organic fabrics. Jessica: You recently had a big fashion show in Boulder, CO at Shine where you launched your line, The Om Collection; do you see these clothes making it to larger cities for Fashion Week or showing up in more high fashion magazines? Katie: This was the first year that Denver had a Fashion Week, before that you had to go to NY, Vegas or LA. There is a push for Denver to be a base for up and coming trends. There is also a call from some of the alternative communities in CO to create a Rocky Mountain “look.” California has its own style, NY has its distinct look and the South has its own esthetic while the mountains towns do as well. The focus here is on being functional and having an active lifestyle in what can be very extreme temperatures. 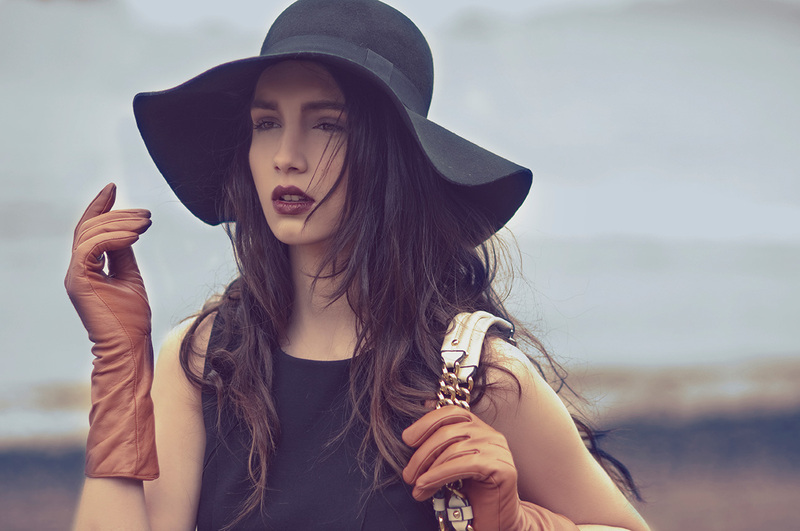 Incorporating fashion allows you to play hard and look great while doing it, right? So the goal here is to be one of the front runners. Right now we carry 12 different designers and are looking to add a couple more. We are building our own self titled, “The Om Collection” line to set an example of what is Colorado or Rocky Mountain fashion. We do think that that will actually effect both the NY, Las Vegas and California fashion worlds because everywhere we have taken this collection people are really excited about it – it is so versatile as it works great for one person to wear to yoga and it is great for another person to wear to dinner to a 5-star restaurant in NY or a night club in Atlanta. They mix and match extremely well for all different environments. Jessica: You are getting ready to head to Bali to start working on your line, Katie. Can you tell us a little more about it and the vision behind it? Katie: For me, I try to blend creative, artistic and personal expression. I knew I wanted to work on a yoga line. Occasionally I can find something that I like, but it is very rare. I want to feel like I am wearing something more than just active wear or sporty clothes. On the other side of this is for almost seven years I did not by any leather. I only bought used clothing, or clothing that lined up with my morals. I found that I basically didn’t buy anything. It was really frustrating. I wanted to enjoy the esthetics of being fashionable and fun but did not want to be making a negative impact on the environment or the communities producing the clothing. This last year has been a bit of a struggle for me as that is not the way fashion is run generally. When I launch, it will be very meticulously in line with my philosophy. The fact that we make our clothes abroad is upsetting to some people, but having watched the positive impact it has on the lives of the people I work with, I have absolutely no moral problem working out of Bali. We are educating the people who are making the clothes on organic food and how to be healthy eaters, how not to litter, certain feminist principles and generally improving the lives of the people who work for us by giving them a stable life. We will be working with organic bamboo and cotton. I am working on mostly shawls and jackets; things that are really amazing for over yoga clothing. The truth is, you need a sports bra that works as a sports bra and there are some benefits to having a simple pair of leggings while you do yoga but you want to quickly turn that into an outfit you can walk out of the studio and be ready for your day or evening, so I am looking to create a lot of the connector pieces. Jessica: Explain your thought process when creating and then photographing an image? Carl: If I am thinking of a theme or body of work, I start the old fashioned way with a pencil and pad, sketching ideas, thinking of locations, models or yogis and of course, the lighting I need to create the look I envision. Then it becomes action, figuring out the time of day gets the shot, who to work with and what they need (clothes, make up, etc). Once logistics are worked out I start to consider the equipment I am going to use. On the day of a shoot I manually set the camera’s aperture and shutter for the desired look. The most important element is bonding with your environment and subject and letting go of the technical preparations to simply be with your camera which is your artist’s tool. A great relationship between all parties makes ART. For this set of work my goal was to show the lines of the human body inside the architectural structure, to show the balance of solid and fluid in one image. These are traditional poses, modified to fit the form of the building by highly trained and skilled yogis, I used only natural light to keep the whole series clean and simple and in union (the meaning of yoga) with its surroundings. Let’s analyze one shot, Rachel and the stairs leading to the back of the Boulder Museum of Contemporary Art, or BMoCA. To keep with the architectural nature of the shoot I used my full frame Nikon D700 with a 28mm pc Nikkor tilt shift lens. I set my exposure as I always do, manually. The shot was taken at 1pm in December so the winter light was strong but not too high in the sky, creating a deep shadow under the stairs and a direct line for me to follow and form my shape into. The strong light also allowed me to set the camera at ISO 100, shutter at 1/160th, mounted on a tripod and released with a cable, and my aperture was set to f11 giving great depth of field allowing me to seamlessly blend the forms together. I set my white balance for the blue sky at 5050K. To create the image in black and white I imported the RAW files in to Adobe Lightroom and made small changes to the color channels and saturations of light and dark, then added a slight 3 point vignette and a touch of sharpening for output, no photo shop work at all for any of these images. Jessica: Carl – in your body of work – form, shapes, light, nature and architecture can be seen individually or working with the body, namely your fine art nudes. 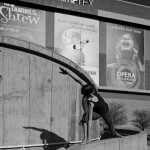 What was it like to be working on a fine art yoga series and working with clothing that is meant to be seen and shown? 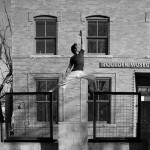 Carl: Yoga is very fluid and moving and it is an individual practice for everybody. There is no perfect updog, or triangle… everyone has their own unique physiology and their own unique body, watching peoples bodies merge and try to blend with the lines with these fixed architectural shapes is an interesting mix for me. Normally I work with nudes and it is just the body and the lines of the body. Now I am trying to blend the two together. It is almost like working backwards for me. I am watching myself and thinking: I would normally try to shoot like this and look for the light to sculpt the body but this time I am looking for the building to be that sculpting portion and the body has to work its way into its own shape inside it. Working with the clothing, as opposed to nudes… one of the great things about this line is that it is artsy and eclectic. The ruffles and the details in the clothing lend itself to a time past and the present moment. That is kind of what fashion is. Working with the clothing gives me the freedom to say, “For some looks I need this and for other looks I need that.” Then I can find the balance between the pose, the clothing and the shape that it all needs to fit into. Katie: My background is in fine art. I left it because I never thought I would make an impact with it. That was a false perception that I had. My reason for it was that there were so many images out there in the world and it is so difficult to feel that enough people would see it or spend enough time with it to really understand the message behind it. The exception for that, for me is print media. A magazine is picked up in order to study or enjoy it. Articles in particular are approached with the goal of enjoyment or entertainment. Ideally it is some kind of forward thought to act or do or inspire. What excites me about this series is that it inherently raises the bar for artwork in general. It’s basically saying the human body, being a gorgeous piece of artwork constructed in a way that requires year’s worth of training to move into poses that have their own expression, like calligraphy of the body; and then we put these bodies into a space that was created by human beings – while again we are wearing clothing made by humans. It is like a large scale production that is easily digested into a single image or article. That for me is an exciting statement because it is not being done in just the fashion world or just the yoga world or just the architecture world. Instead it is this blending of human beings, fashion and space and I think this is just the beginning. Jessica: Carl, can you talk us through one of the images and how you are blending yoga with architecture and fashion and share any future plans for similar work? Carl: Let’s take the image of Katie on the stairs. 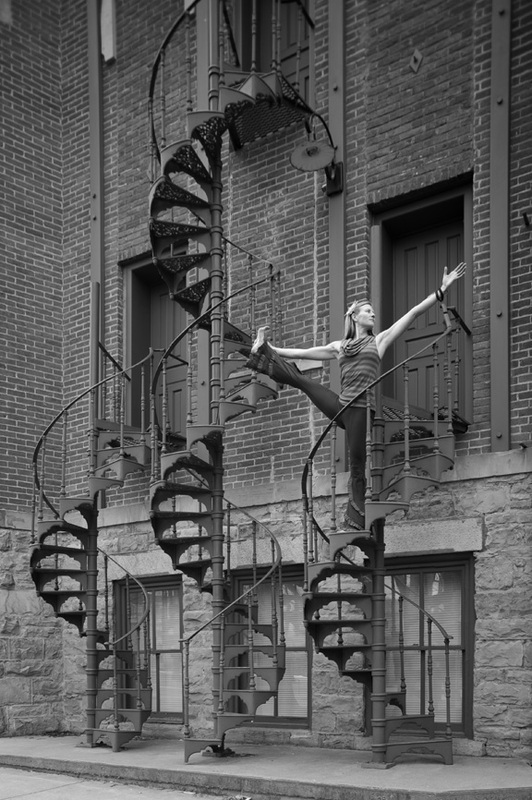 My focus here was a pose that would not hide the clothing behind the railing so we went over them with a variation of Utthita Hasta Padangustasana, her leg lines up with the upward flow of the middle stair case, the arm and leg forming a triangle mimics the shape of the steps and the line of her left arm follows the metal railing. A perfect symmetry of lines and form. I have another couple of concepts, one centered on finding the stillness in our world of constant flux. I have an obvious fascination with Black and White images, I have recently acquired several film and Polaroid cameras that I am having fun playing with, more to come there and I will be launching a new web site in the spring (www.fotaography.com) for personal and commissioned art work based on the Buddha’s teachings of the 4 elements of Earth, Air, Water and Fire and all that is Zen in the world – lots of yoga here. 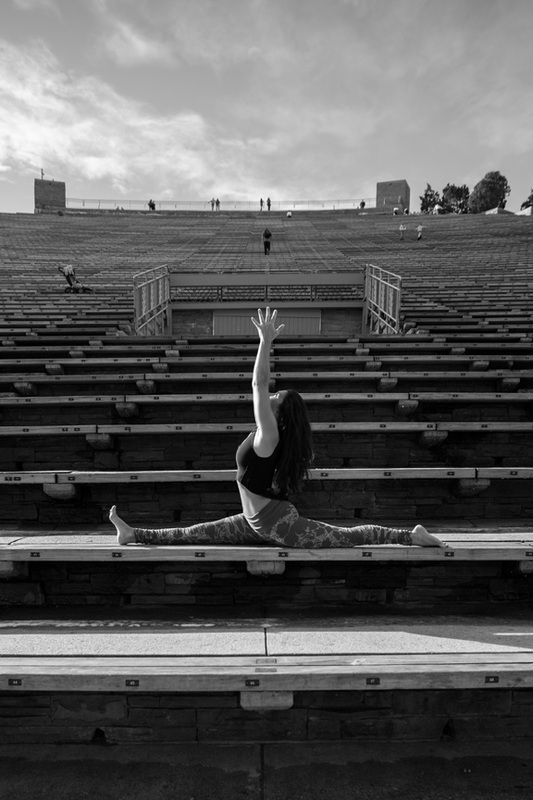 Also coming up is the summer yoga festival tour, starting this year in Colorado with Hanuman Festival June 8-10 in Boulder and ending in Estes Park for Yoga Journal in October, that’s going to be real fun ad an amazing way to connect with world class teachers. Jessica: At the fashion show for The Om Collection, which you shot Carl; there were models there who were not yogis. If a model is really interested in posing for yoga what advice you would give them? Carl: Just coming from a photographer’s perspective – one of the things I find the most challenging about working with models is when they don’t have confidence in themselves. I have found in working with people who practice yoga that they have the ability to radiate calm and confidence when we are shooting. It is not about modeling. That inner calm needs to come through and that is easy when you are shooting someone who actually practices yoga. 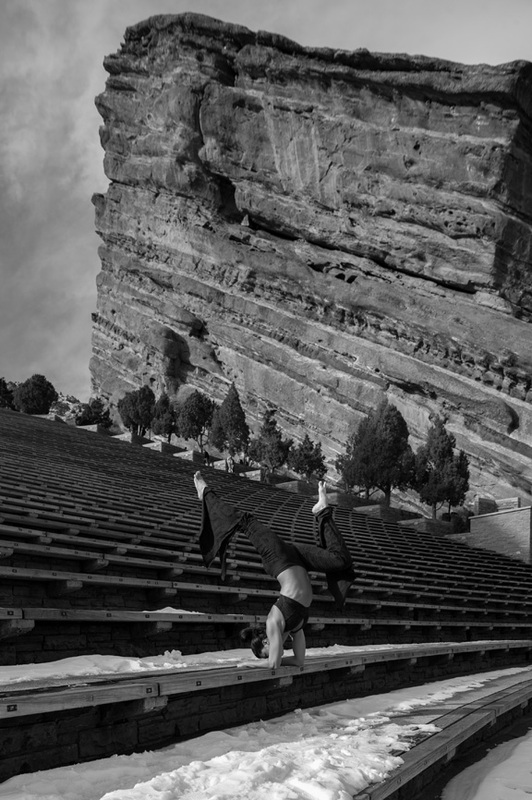 Models that want to shoot some yoga shots are going to come at it from a different perspective. 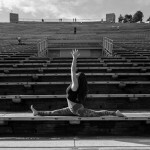 With yoga it is more subtle – letting yourself shine through. Katie: I have done some modeling work from high fashion to bridal to industrial. People think that these are just naturally beautiful individuals stepping in front of the camera to model – but really there is an art to modeling. There is a contortion element, there is an understanding of how light hits the body in a contrived setting and also figuring out what you are modeling whether you are modeling jewelry or clothing or doing a head shot. All those require putting something different forward. frenzy magazine is providing a fresh look at fashion, design, art, beauty and photography.